Comic-Con kicks off in just a few short hours, so we’re at the San Diego Convention center putting the shine on new premiums, signed goodies, and much, much more! Make sure CBLDF booth #1918, our welcome party, panels, and auction are on your Comic-Con to-do list! We’ll be ready to meet comics fans and free speech defenders when the hall opens at 6:00 p.m. tonight! Meet Great Creators! Every year the greatest creators in comics drop in at the CBLDF Welcome Party. Dozens of creators are expected to stop by over the course of the night, with Marc Bernardin, Nick Dragotta, Brenden Fletcher, Sina Grace, Megan Hutchinson, Jock, Jeff Lemire, Dustin Nguyen, Amy Reeder, Nicola Scott, Gail Simone, Joshua Williamson, and more already confirmed! Get Amazing Gifts! The first hundred attendees will get an amazing gift bag that includes a t-shirt courtesy of Image Comics, two surprise items courtesy of comiXology, and more! Celebrate ComiXology’s 10th Anniversary! ComiXology is celebrating ten years! Join us in toasting the creators and readers who made this milestone happen, with a free drink ticket to the first hundred folks to arrive courtesy of comiXology! Smell Awesome at the Black Phoenix Alchemy Lab/Trading Post! Black Phoenix Alchemy Lab will be introducing F#@K — a censored scent, reminiscent of sugar crust with a hint of cherry meringue — which will only be available at the CBLDF Welcome Party. Also debuting that night: Neil Gaiman’s 15 Painted Cards From a Vampire Tarot, plus BPAL’s full series of Neil Gaiman’s American Gods fragrances. Proceeds from every sale at the CBLDF Welcome Party benefit CBLDF! Get First Dibs on CBLDF Exclusives! 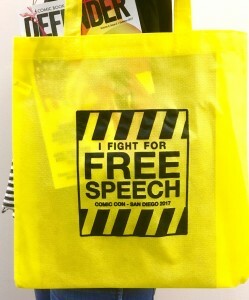 CBLDF has an exclusive assortment of great items promoting intellectual freedom for Comic-Con attendees! We have all-new stickers, patches, and pins that you can get at the party! Preview the Incredible Items in CBLDF’s Comic-Con Auction! Get a first look at the amazing original art up for grabs at Saturday’s CBLDF Comic-Con Auction, sponsored by IDW Publishing, Splash Page Comic Art, and the San Diego Comic Art gallery! Items include original art by Frank Miller, Charlie Adlard, John Cassaday, Jeff Lemire, Jock, Sean Phillips, and many, many more! 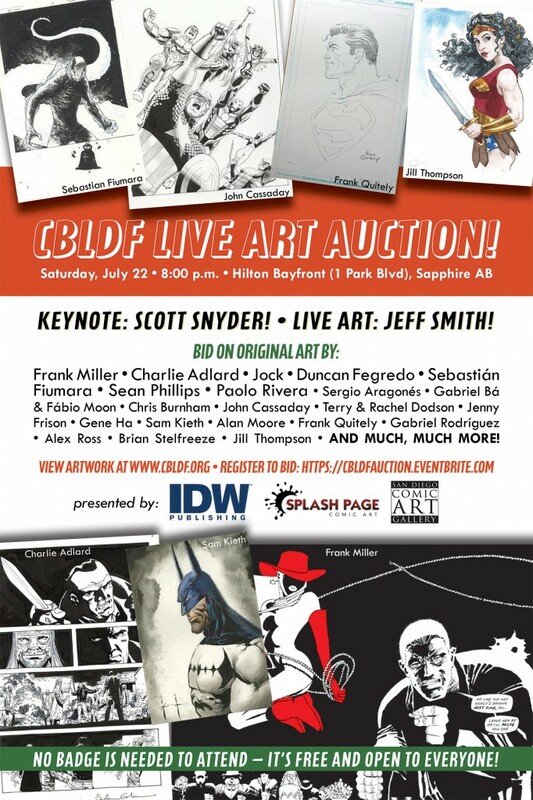 Join IDW Publishing (Booth 2743) and the San Diego Comic Art Gallery and Splash Page Comic Art (Booth 4400) to support Comic Book Legal Defense Fund’s Comic-Con Live Art Auction, happening Saturday, July 22, at the Hilton Bayfront Sapphire AB. The event kicks off at 8:00 p.m. with a keynote address from Batman scribe Scott Snyder will open the evening, while Jeff Smith, creator of Bone and host of Cartoon Crossroads Columbus (CXC), makes live art that will be auctioned off at the end of the night! Bid on original art, including work by CBLDF Defender of Liberty Frank Miller, Splash Page Comic Art starsincluding Charlie Adlard, Jock, Duncan Fegredo, Sebastian Fiumara, Sean Phillips, and Paolo Rivera, plus contributions from CBLDF supporters including Sergio Aragones, Chris Burnham, John Cassaday, Terry and Rachel Dodson, Gene Ha, Sam Kieth, Carla Speed McNeil, Gabriel Rodriguez, Alex Ross, Jill Thompson, and many, many more.All this, plus out-of-print Artist Editions from the IDW vaults! More than 60 lots will be on offer to benefit CBLDF’s important work, with more surprises to come in the days leading into the con! 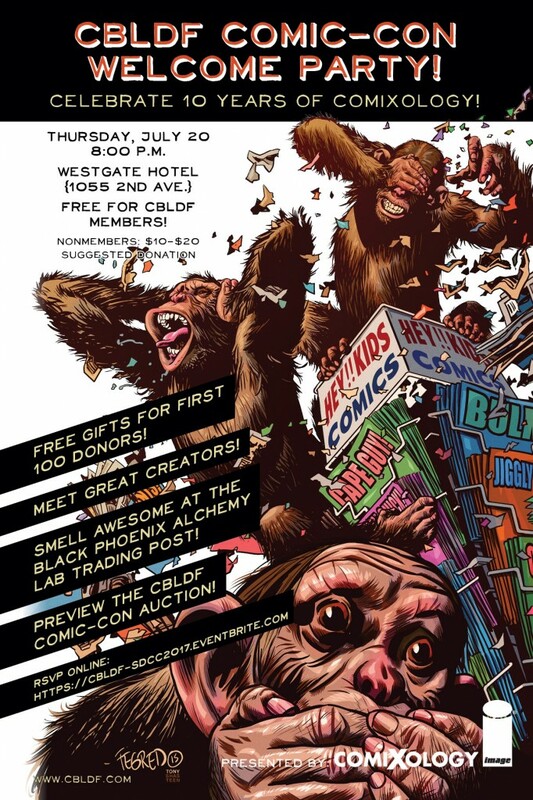 This auction is open to all – YOU DO NOT NEED A COMIC CON BADGE TO ATTEND! If you are unavailable for the live auction, but still interested in bidding, please send a list of the pieces you are interested in with the HIGHEST donation you would be willing to bid. If the high bid on the auction floor is below your highest bid, your final bid will be 10% higher than the last highest bid on the floor. Your bids should be delivered to Betsy Gomez (betsy.gomez@cbldf.org) by 3:00 p.m. PACIFIC TIME July 22 to be eligible. You will be contacted immediately after the auction with any winning bids. Comics are uniquely vulnerable to challenges and bans, especially comics for teen audiences. Learn about challenged and banned comics and what you can do if they’re challenged in your school or library with panelists Raina Telgemeier (Drama, Ghosts), Candice Mack (Teen Services manager, Los Angeles Public Library), Gina Gagliano(marketing and publicity manager, First Second), and David Saylor (VP / creative director / trade publishing / editorial director, Graphix). Moderated by Betsy Gomez (editorial director, Comic Book Legal Defense Fund). 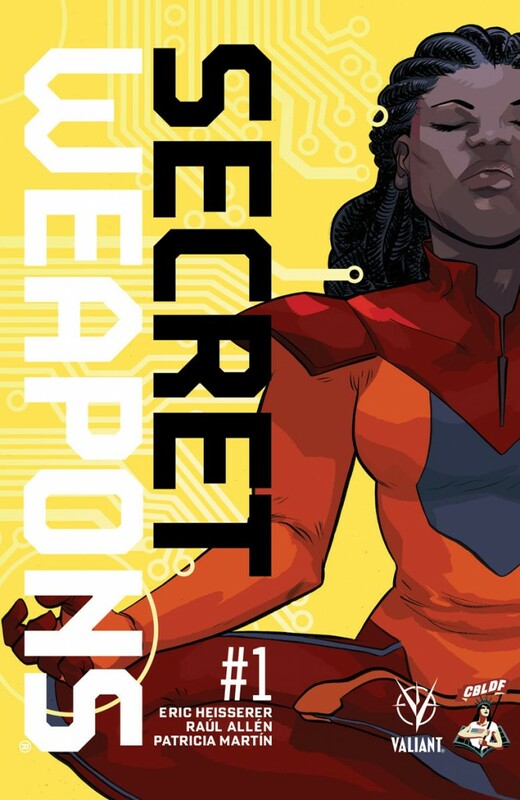 Valiant is proud to announce its support for CBLDF with the Secret Weapons #1 SDCC Liberty Variant – a special, limited edition release of the first issue of the acclaimed new series starring Livewire and Valiant’s extraordinary new team of heroes in the making! Featuring a brand-new cover by multiple Eisner Award-nominee Erica Henderson (Unbeatable Squirrel Girl, Jughead), the Secret Weapons #1 SDCC Liberty Variant will debut during Preview Night on Wednesday, July 19, available exclusively at CBLDF booth #1918 and via the CBLDF website (cbldf.org). 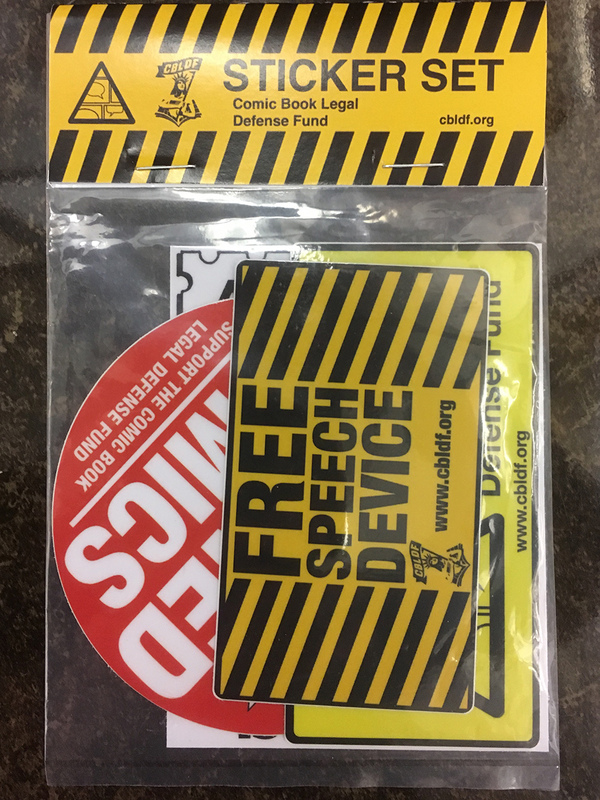 All proceeds will directly benefit the First Amendment legal and education work of CBLDF. 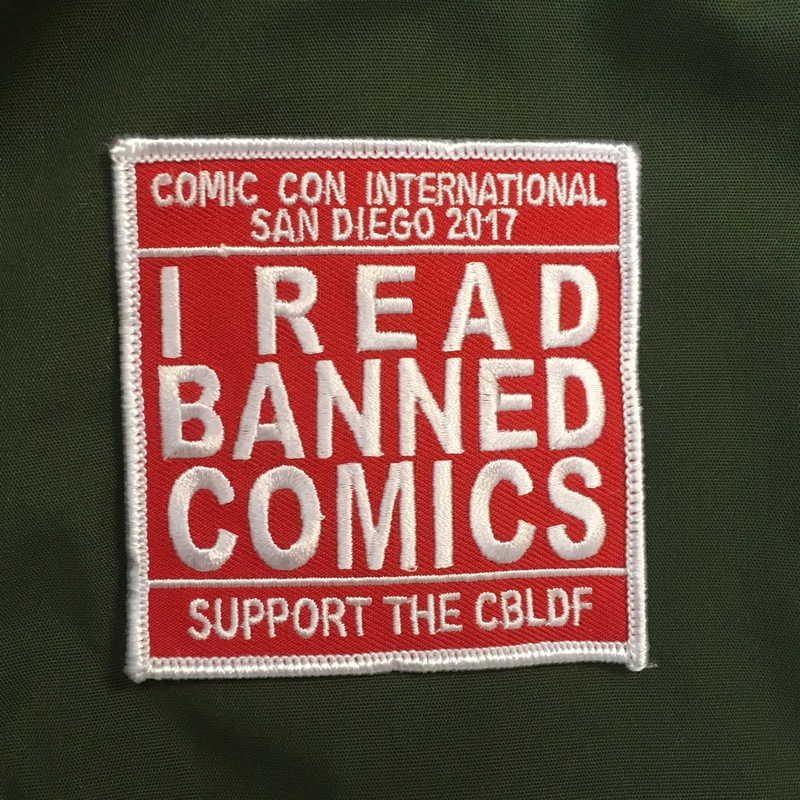 CBLDF has created a number of limited availability exclusives for our donors attending Comic Con International in San Diego! Available in booth #1918 throughout the weekend, these items are brand new and several have been created especially for SDCC 2017! 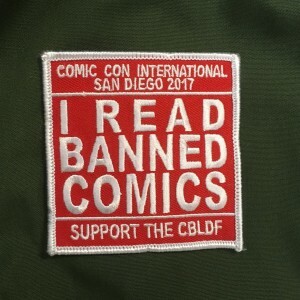 First up, we have the “I READ BANNED COMICS” embroidered patch, available in two styles: a square one commemorating SDCC 2017 and an undated circular version. 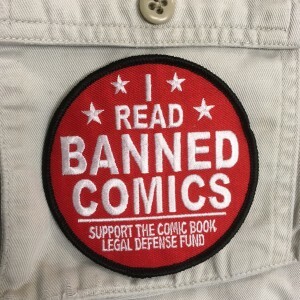 A new CBLDF Sticker Set will also be available, featuring four stickers: three brand new designs and one classic, the Comics Code Authority Seal. 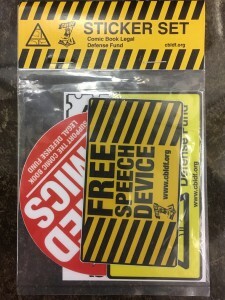 All stickers are made from durable vinyl, and perfect for cell phones, computers, notebooks, or the back-ends of motor vehicles! 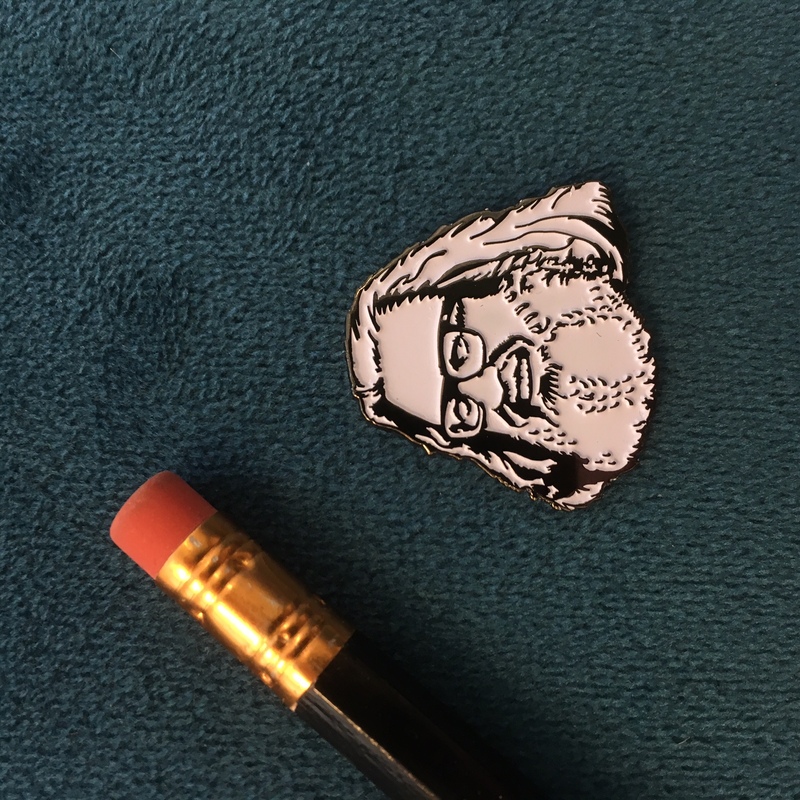 For the classic comic fans, we have a brand-new CBLDF Enamel Pin, featuring the smiling visage of one of comics greatest publishers, William Gaines. With art by Tony Shasteen (Star Trek), this image has been repurposed from the enormously popular “BILL GAINES WAS RIGHT” t-shirt. 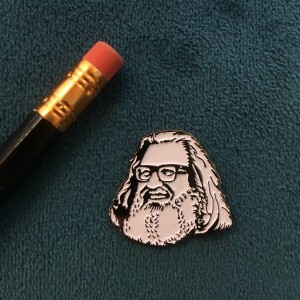 The pin is being made available for the first time at SDCC 2017! Finally, we have our annual CBLDF Tote Bag, this year in striking Caution Yellow — perfect for storing all the comics you will take home from sunny southern California! Don’t miss these SDCC exclusives, signed goodies, and much more during Comic-Con! 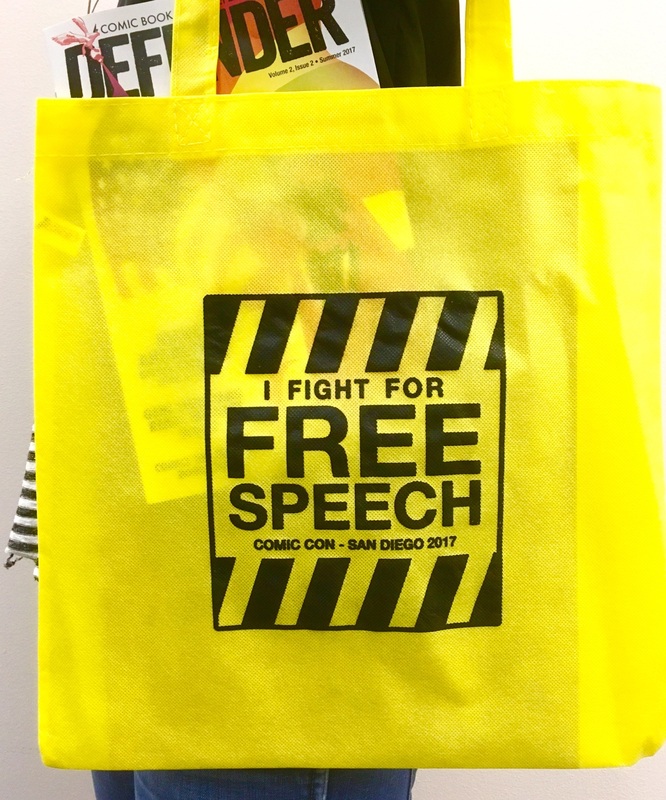 Get yours and support free speech at CBLDF booth #1918, July 20–23 (preview night July 19)!